The J and G Lau Family Meat Processing Center (completed Oct. 21, 2011) is a fully functioning plant with the capabilities to involve students in all stages of meat processing from harvesting to packaging. Designed to supplement students’ classroom instruction, the center will give them the opportunity to apply learned principles to industry-like practices and experience. The meat processing center includes a harvest floor that offers separation between hide-on and hide-off rooms for beef, veal, lamb, pork and goat; a designated area for harvesting chicken and turkey; a meat fabrication and processing space; a one-truck food processing oven; a ready-to-eat packaging area and ready-to-eat coolers; a HACCP area for food-safety testing; and a multi-purpose room for short courses and outreach work. 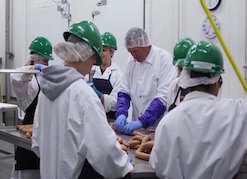 The goal of the new meat processing center is to provide students with a education on the forefront of meat processing; additionally, meat science companies nationwide are able to use the facilities for product development, safe testing and marketing—Cal Poly and the Animal Science Department believing that the best education is one that works with current industry, providing students with an environment that encourages real-world immersion and opportunity.